By 1989 a group of Portuguese Water Dog (PWD) show enthusiasts in the Pacific Northwest were already gathering due to their interest in this newly recognized breed. Loosely held together by their budding group’s regional newsletter edited by Veryl Ann Grace, and encouraged by the Portuguese Water Dog Club of America (PWDCA) established 1972, they held their first organizational meeting at the Brush Prairie show cluster in July of 1990. There they appointed officers with Chet Young the first club president, discussed a logo design, and planned to recruit new members who owned our delightful and vibrant breed. The first official meeting was at the home of Laird Philbrick who had invited a groomer to discuss coat type, trims, and general PWD care. While conformation was a strong focus from the outset (witness fun matches in August 1997 and June 1998 at the Kayak Point picnic and the Puyallup show respectively), the club promoted water work at the very start as well. In 1989, founding member Laird Philbrick, hosted a salmon barbecue attended by 18 dogs and 26 people which stirred up enough excitement to launch a water event the following year. 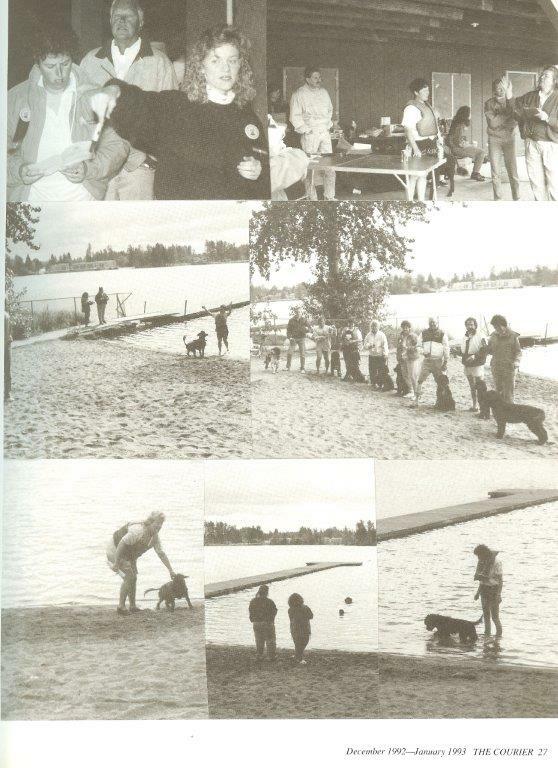 Laird’s enthusiasm, and early PWDCA guidelines for our breed-specific water sport, resulted in our club’s “Splash Day” on September 9, 1990, organized by founding member Katrina (Jez) Jackson. Twenty PWDs and their owners from around the Pacific Northwest gathered at a Vashon Island beachfront home where they received water sport guidance from the founder of the Washington Newfoundland water trials. Longtime member Joanne Forsythe planned three tasks for beginners—wading to chest depth, nose under water, and boarding/riding a row boat. Happily, any dog with four wet paws earned a commemorative Splash Day participation ribbon! Water work quickly became central to the club, and in September 1991 under the PWDCA sanctioned rules, Junior Water Certification was held at Silver Lake in Everett, Washington. It was one of the earliest water trials in the USA offered by a regional club. Newfoundland judge Karen Turnquist was assisted by club members Susan (Helsel) Myrick (trial secretary), Katrina (Jez) Jackson (chair), and Christie Overton (chief steward). Remarkably, our regional custom of awarding a “Team Spirit” award began at our very first trial. A Water Workshop attracting 19 participants followed in May 1992, and in September that year the club’s Water Trial attracted eight teams, six in Junior and two in Apprentice. By 1993, however, Judge Judi Adler from Portland, Oregon found herself working with seventeen entries: nine Junior; six Apprentice; and two Working. Entrants arrived from all over the northwest with one from as far as Minnesota. Water work was well and truly established in the PNWPWDC! 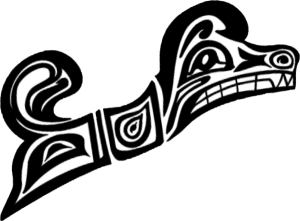 By the winter of 1993 the PNWPWDC had passed the first version of the club bylaws. These bylaws — with occasional necessary changes in keeping with the AKC and PWDCA — have ably guided the club over the years to include PWD education and other activities. While the PNWPWDC has long been a sanctioned regional club of our parent club the Portuguese Water Dog Club of America (PWDCA), we also became a licensed sanctioned club by the AKC in 2011. The AKC sanctioning allows us to hold independent regional specialties, obedience, rally and agility trials, as well as tracking tests. While our emphasis on conformation and water work has continued throughout the years, our club has also introduced and supported a variety of other activities and sports. Some of the earliest activities include Canine Good Citizen testing at a club picnic in Spring 1994; our first Agility fun matches in June 1997; and — given our breed’s history of herding fish for the Portuguese fishermen —the first herding instinct test with a local Australian Shepherd Club of America (ASCA) herding judge in 1994. As we all know, the sport of agility has grown tremendously popular among PWD fraternities and, after years of hosting fun matches, the PNWPWDC now hosts its own Agility Trial annually in March. Nonetheless, water work and conformation still form the basis of our competitive events during the year, with water work culminating in two weekends of trials almost every year since 2005. Conformation, on the other hand, has continued to thrive via our club's hosting of supported entries under the auspices of the PWDCA since the Brush Prairie circuit in 1992. In 2012, our club held its first annual independent Regional Specialty, following AKC sanctioning to hold licensed shows. The PWD fraternity demonstrates a strong commitment to breeding and raising healthy and well-formed PWDs. A focus on health, our club has held eye clinics, a convenient way for local PWD owners to test their dogs for genetics conditions. Other ways our club educates for the well-being of our breed is by fostering an understanding of the physical and psychological needs of the PWD. Keeping their special coats well-groomed contributes to good health and appearance, so grooming seminars were offered as early as 1996. Other opportunities for owner/dog education and relationship building include water work-shops, agility seminars, and “Meet the Breed” programs at various all-breed dog shows. From as early as 1997 our club hosted PWDCA National Specialty in Silverdale, Washington from September 21-25, and offered conformation, puppy and veteran sweepstakes, agility, obedience and water competitions. Entries topped 675 (including conformation, water trial, agility, obedience, and parades). Our planning committee hosted several dinners for attendees and provided health testing and educational seminars. In 2004, the club again hosted the PWDCA National Specialty, this time from October 1-8 in Gleneden Beach, Oregon. This event offered conformation, puppy and veteran sweepstakes, futurity, obedience, rally, agility, and water competition. In 2013, the National Specialty returned to the Pacific Northwest in Albany, Oregon. While our club did not host the event this time, a number of our members were instrumental in bringing it back to our area. While our club’s regional range is broad, stretching across the diverse states of Washington, Oregon, Idaho, Montana, and Alaska, the Pacific Northwest Portuguese Water Dog Club continues to be guided by the founding principles that bind us together. We welcome owners, breeders and enthusiasts living in the Pacific Northwest to join in community for the well-being of our breed. Our aim is that we all come together to share information and resources about the Portuguese Water Dog and to celebrate the marvelous vivacity and joy that these dogs bring into our lives. We are all deeply indebted to the early club members who created the strong foundation upon which our current club now rests. 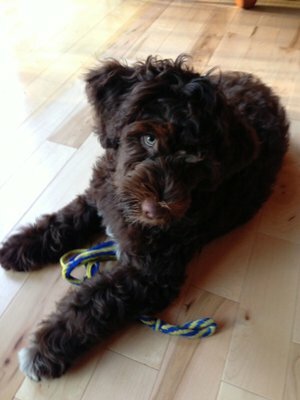 Credits for the photography on this website go to the following photographers and/or dog owners.